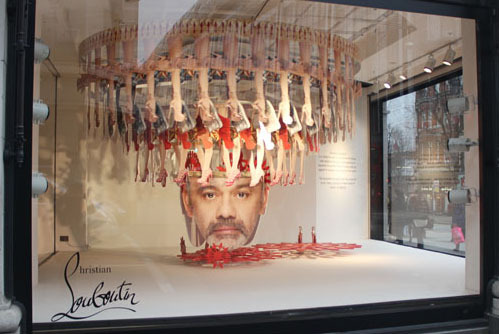 The iconic shoe designer Christian Louboutin celebrates 20 years of a career in shoe design. 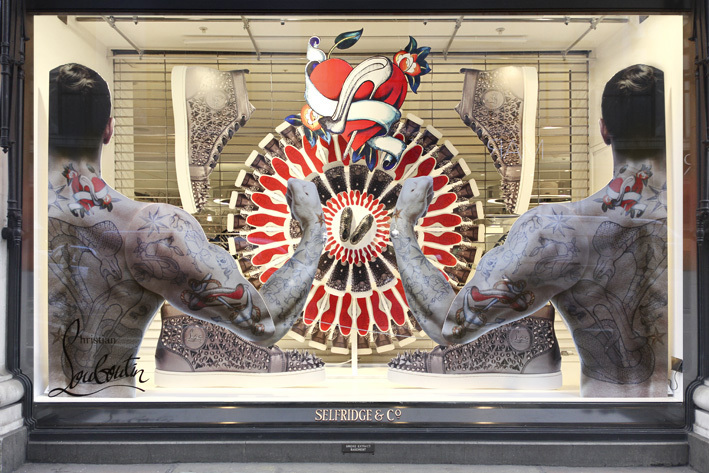 To mark this milestone Selfridges have dedicated a World of Louboutin concept space within the store, as well as series of windows. 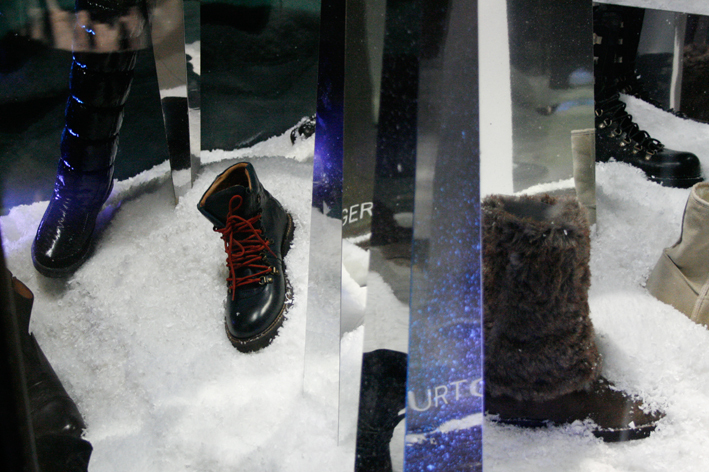 Both were designed and produced by London display design company StudioXAG. The layout of each window celebrates a different shoe in the collection with an effective use of repetition, symmetry and a variation in scale of the 2D printed photoghraphs. The use of mirrors further enchances the repetitive element running through the scheme. The collage of all these elements makes a strong product promotion. Temporary tattoo transfers are available in the concept store. Moving graphics have been incorporated into the designs, which you can see by clicking here. 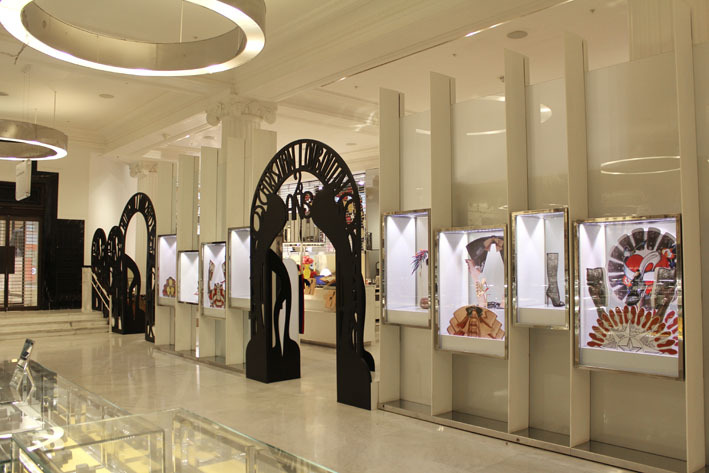 The concept store interiors are very much inspired by Louboutin boutiques including Hollywood style entrance archways, ‘wonder cabinets’ at the entrance and gold plinths with tops in Louboutin’s signiture red. The central focus of the space is the celebratory 20Ans tower, a bespoke acrylic and polished brass display for the limited edition capsule collection. All photos courtesy of StudioXAG. 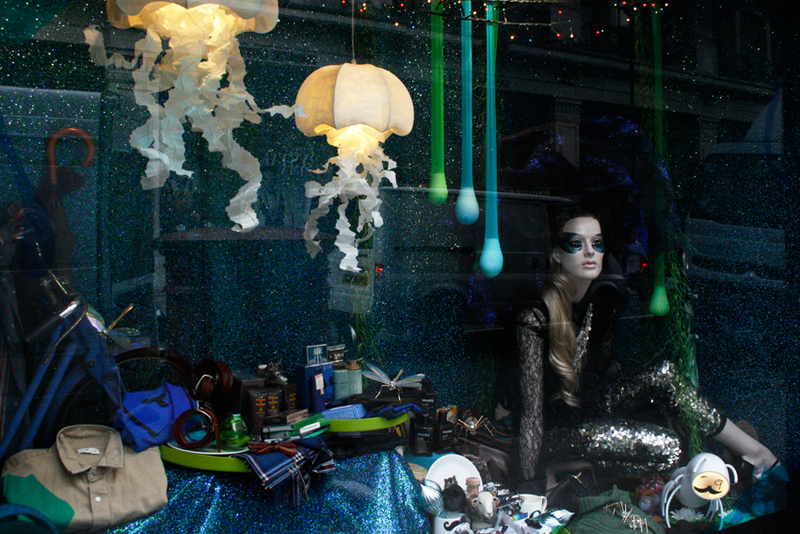 Set up in 2009 by Xavier Sheriff & Gemma Ruse, StudioXAG specialises in art direction and display design for retail. Projects range from prop making and bespoke installations, to design and production of entire shop refits and nationwide window roll-outs. 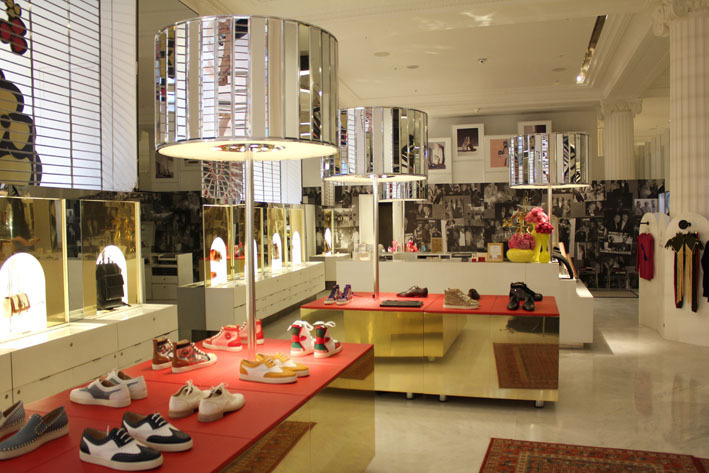 Their clients include Diesel, Fred Perry, London Graphic Centre & Christian Louboutin. It is the time for my first Christmas post. 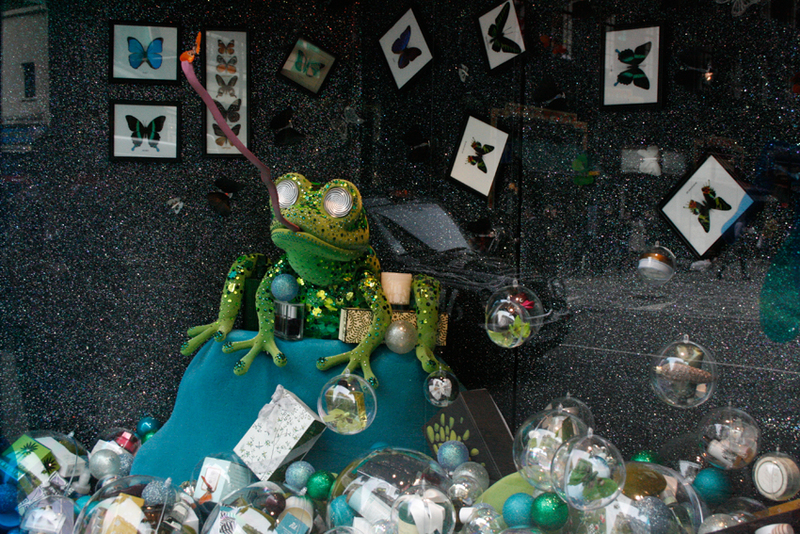 Liberty’s christmas scheme centres around wildlife and celebrates the nature. The mood is magical yet quite dark. It is calming to see something inspired by nature at the most commercial time in retail. What is interesting is that the scheme is not wintery at all. The back walls are covered with blue, green and other earthy coloured glitter material. It is not apparent in the photos but colourful fairy lights are placed on the ceiling. 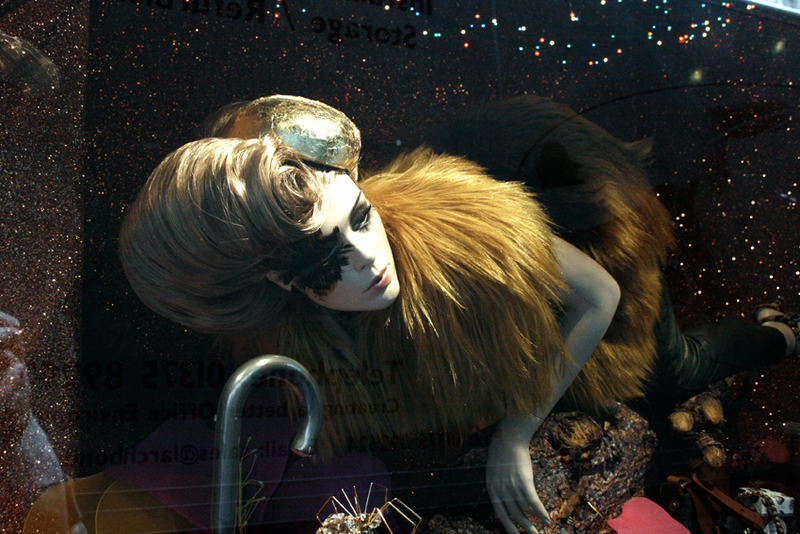 Frogs, caterpillars and butterflies run free… I love the mannequins’ styling. Some of the windows happen in a forest and some are water scenes. 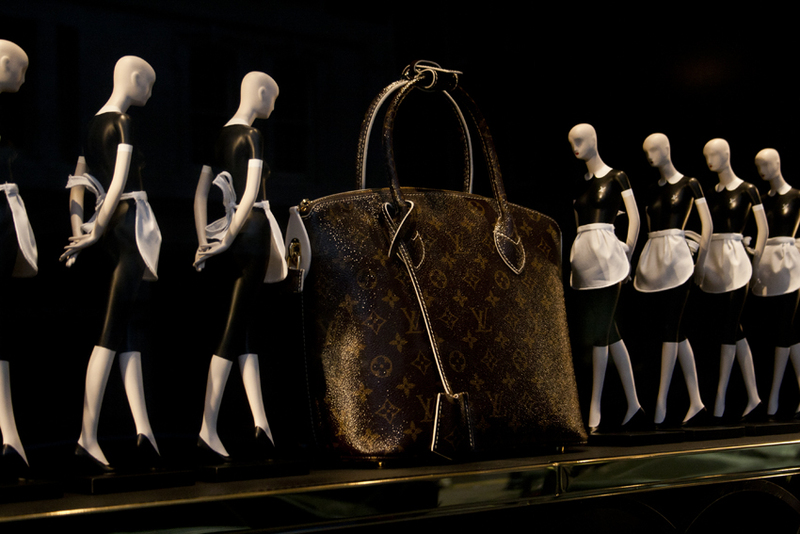 The merchandise is a mix of fashion, home wares and other gifts. 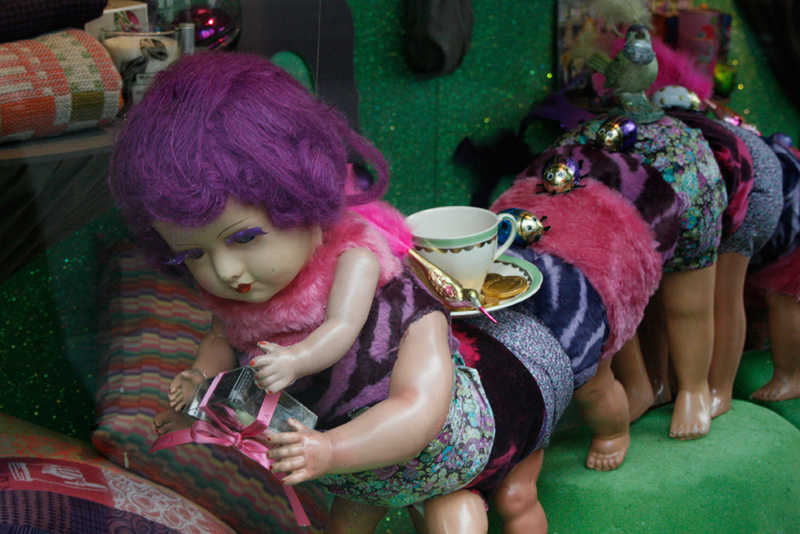 I love this caterpillar doll. Very clever! 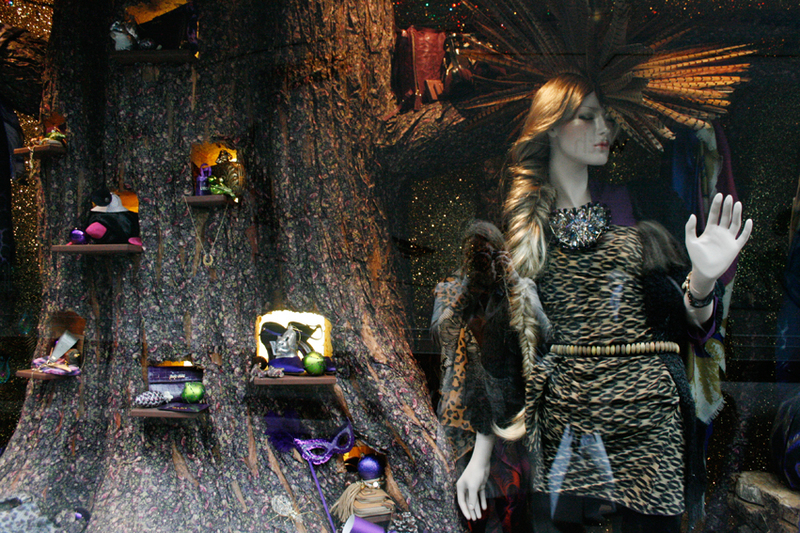 This tree is covered with Liberty fabrics, and the accessories are displayed on little floating shelves. 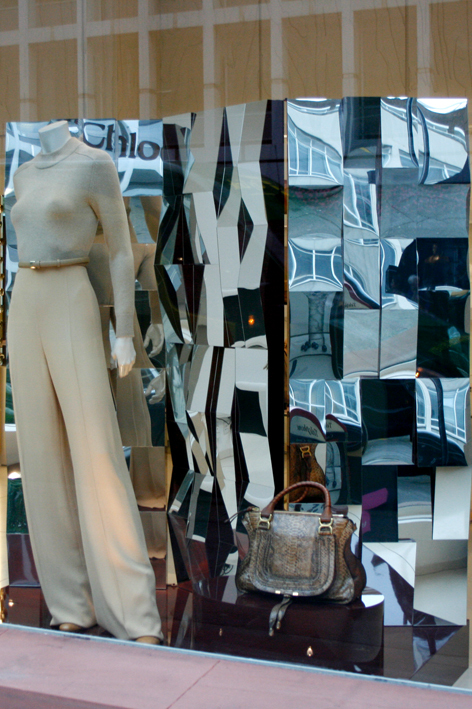 Mirrors are a popular way to create interesting design effects in window displays. They can reflect the product so that the customer sees it multiple times and from different angles. They can make the windows look bigger and create illusions of different space. 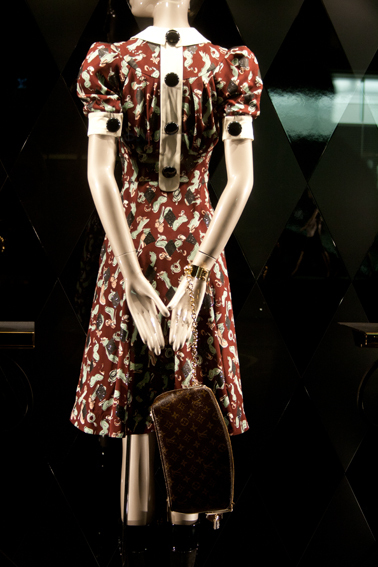 They will also reflect images of the customer and the outside world. 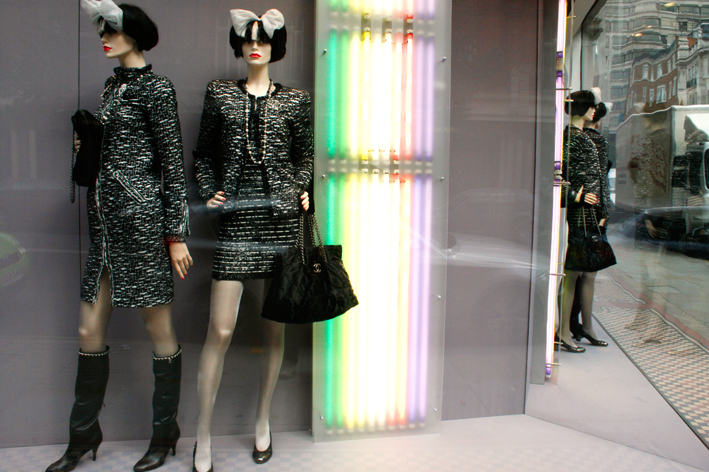 Chanel, Bond Street. I really like the way the mirrored walls create an illusion of a street corner as well as reflecting the coloured lights. 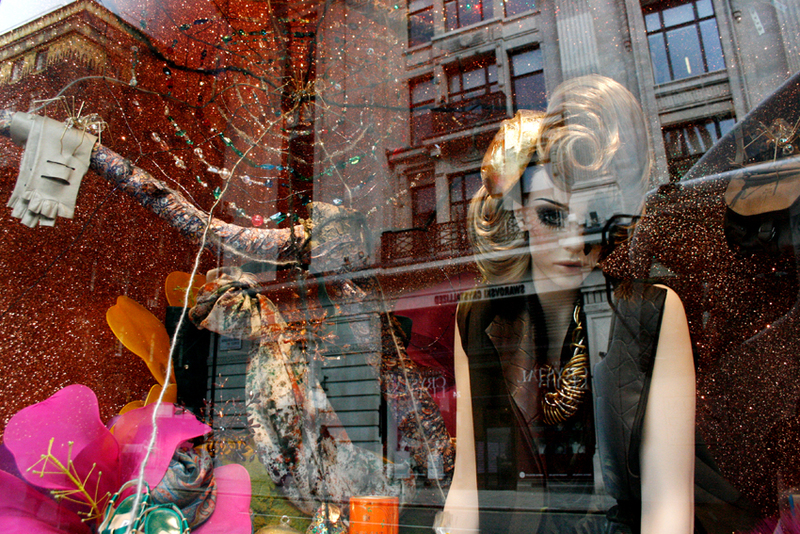 Chloe, Bond Street. Different angles of mirror create an interesting puzzle of reflections. 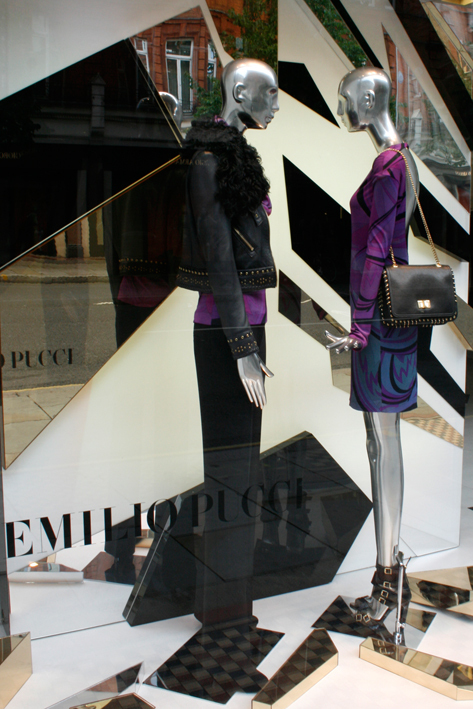 Emilio Pucci, Bond Street. Parts of the back panel have mirrors of different sizes, colours and shapes. Some pieces are also on the floor creating a shattered mirror effect. 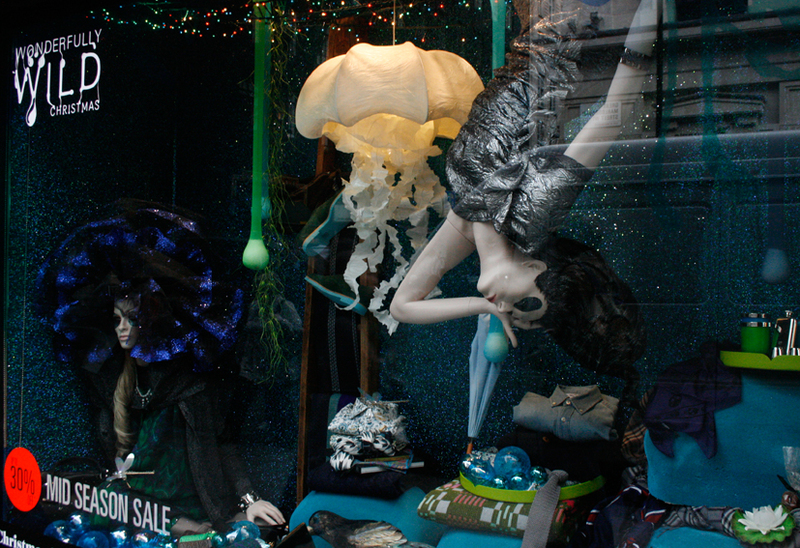 The use of mannequins adds to the tension here: they seem to be having an argument with each other. 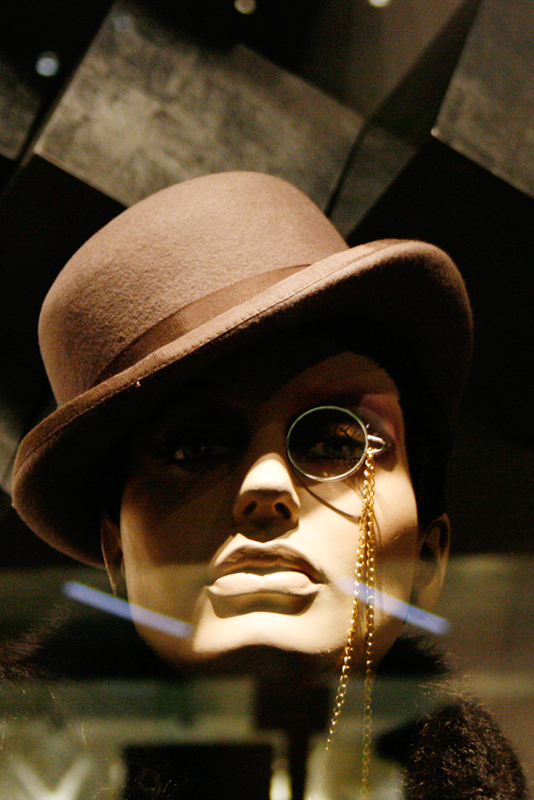 Hermes, Bond Street. Fluorescent light is used together with mirrors to create repeated reflections. 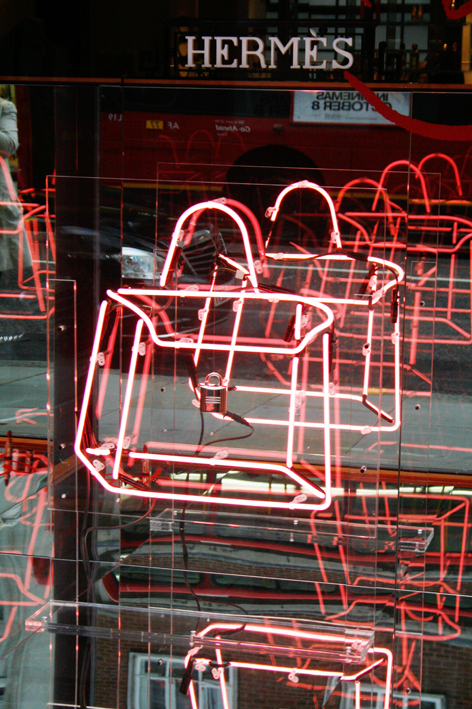 Kurt Geiger, Piccadilly. 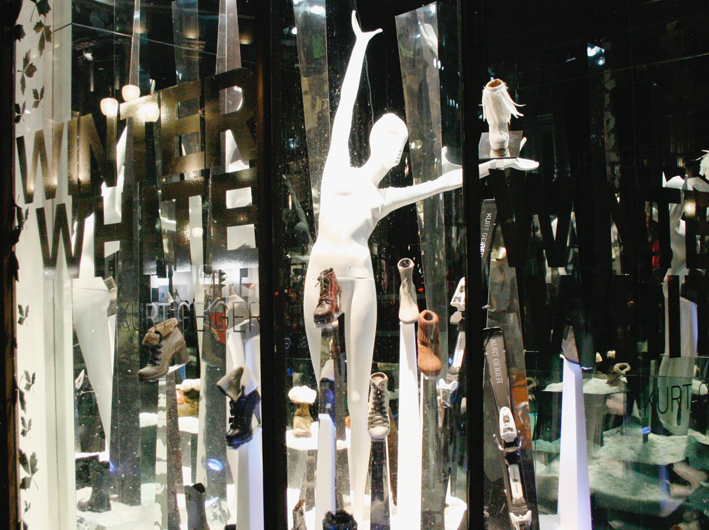 This winter window used mirrored pedestals and props that look like icicles. 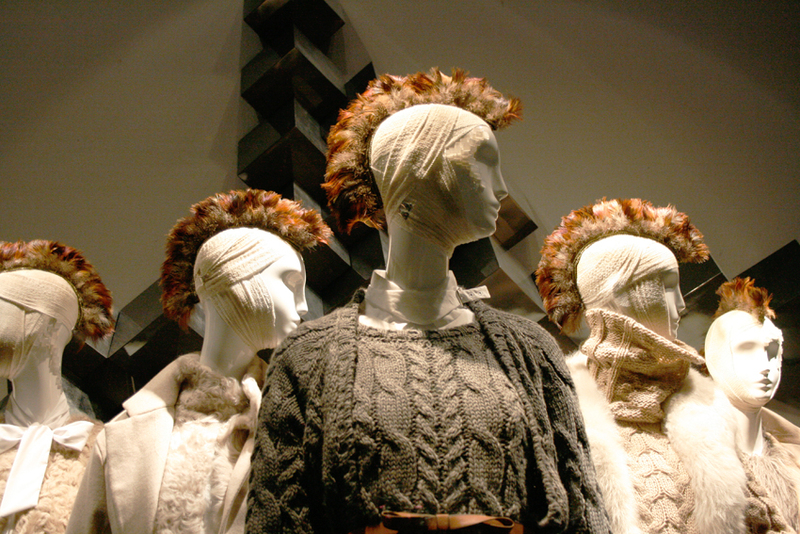 Look out for these daring fashion choices at Zara, they will make your heads turn.. The Zara Oxford Street stores are known for quirky styling and these hair and accessory styling experiments are no exception. 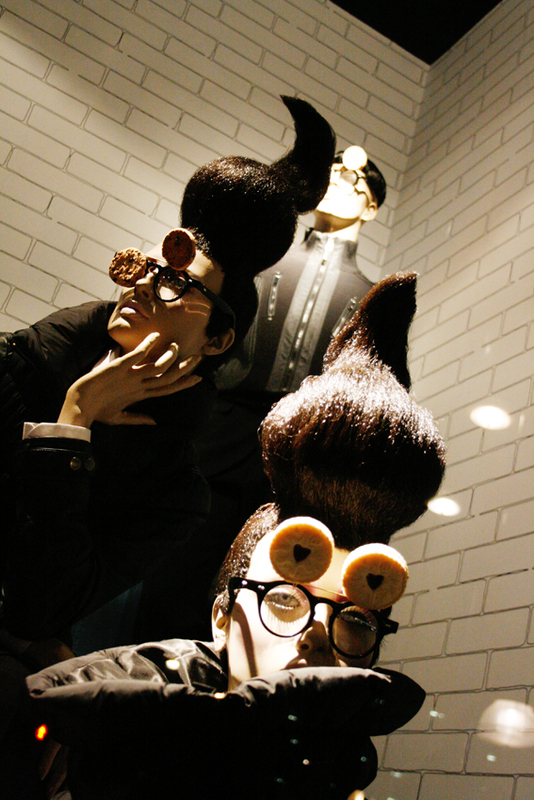 There are bandages around mannequins heads, cookies on their glasses and generally the hair trend is ‘the higher the better’. 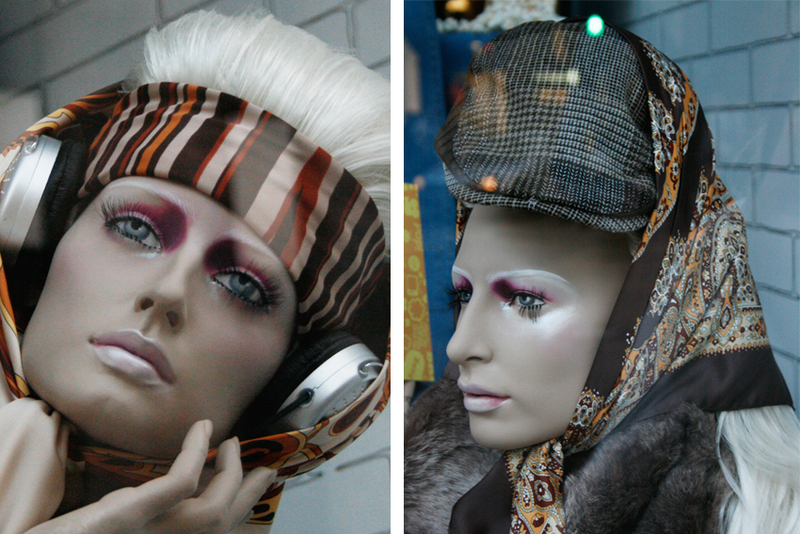 These images will make you wonder why headless mannequins even exist. 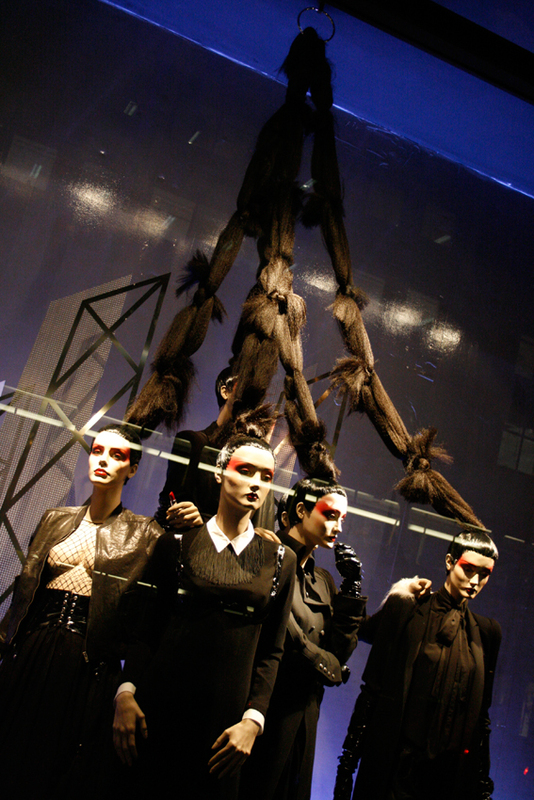 The extreme up-do: I like the way it brings the group together. 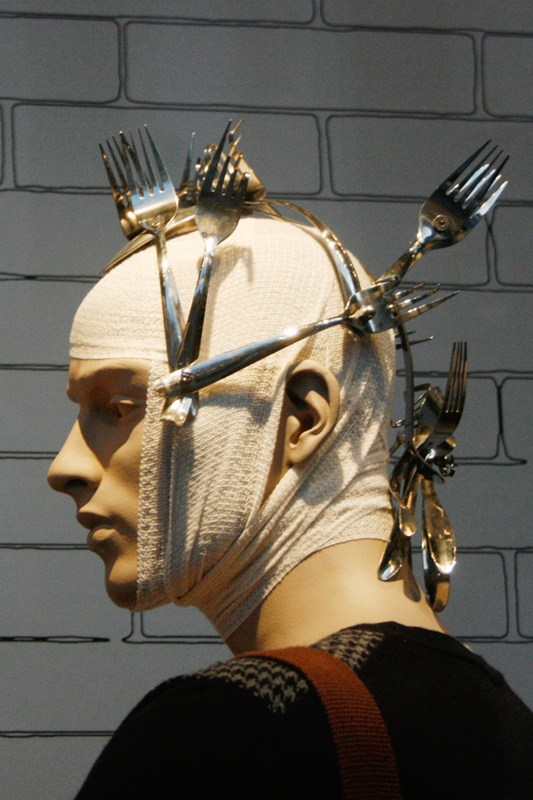 Protection: The bandages and the forks make a helmet. 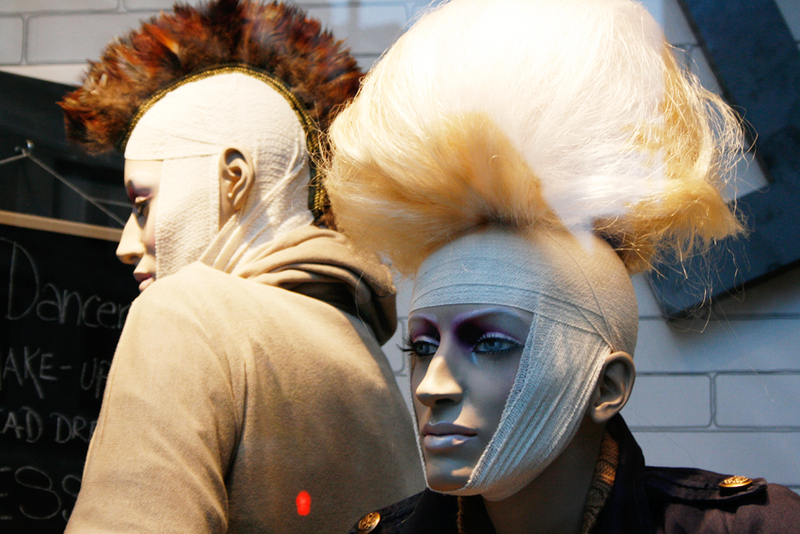 The mohawks give the otherwise soft knitwear an edgy feel. Pile ’em high and tie ’em around. Cookie glasses yam.. this is really cool. The hair is excellent too. 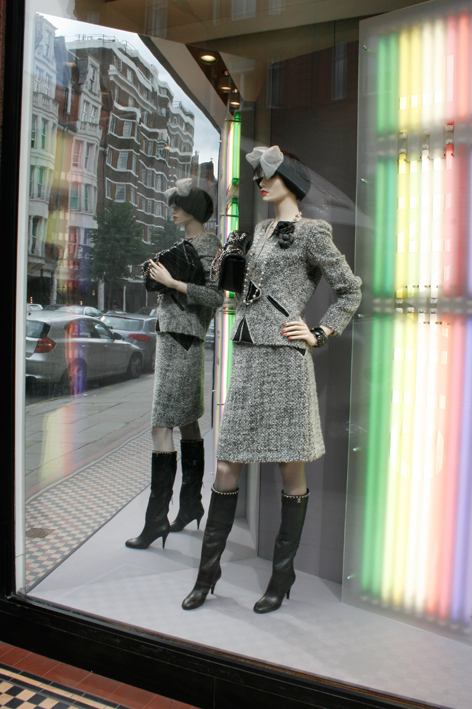 The arrival of The World of Manolo Blahnik is introduced with these windows done in collaboration with the communications agency JustSo. 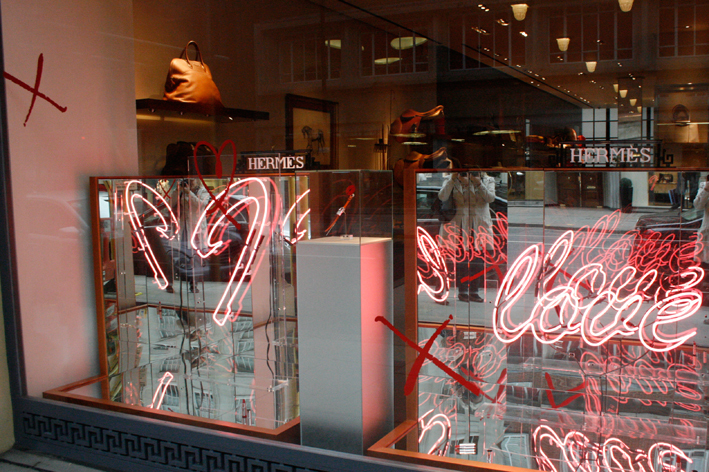 The windows feature provocative japanese style backlit drawings. 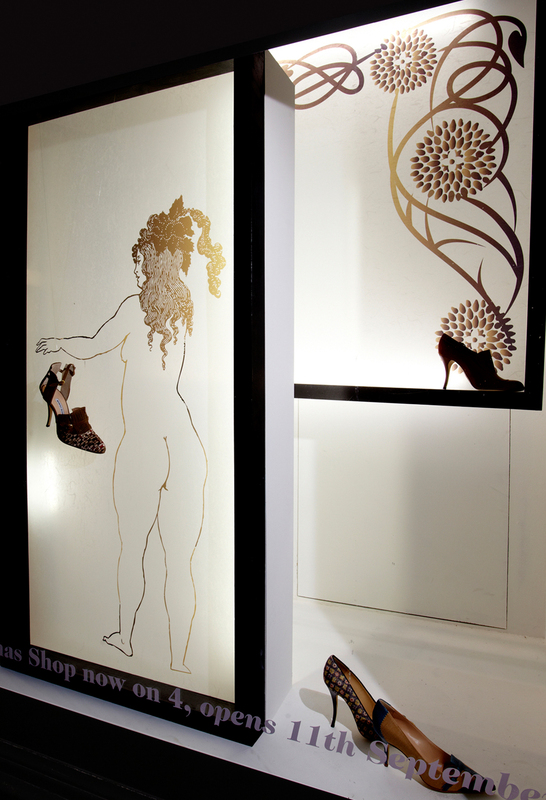 Manolo Blahnik shoes are then hung to interact with the Art Nouveau inspired drawings, as well as placed on some of the black frames. 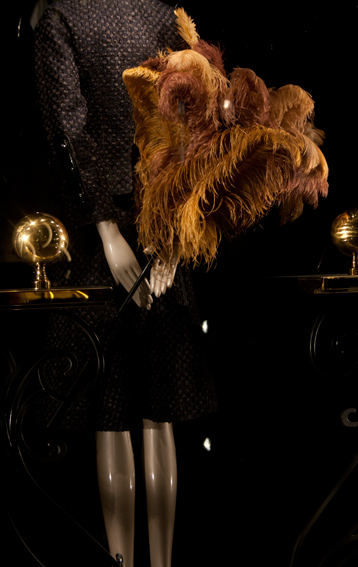 In addition to shoes the collection also includes umbrellas, scarves, notebooks and handkerchiefs. A lot of the items feature his signature style drawings of shoes made into prints. 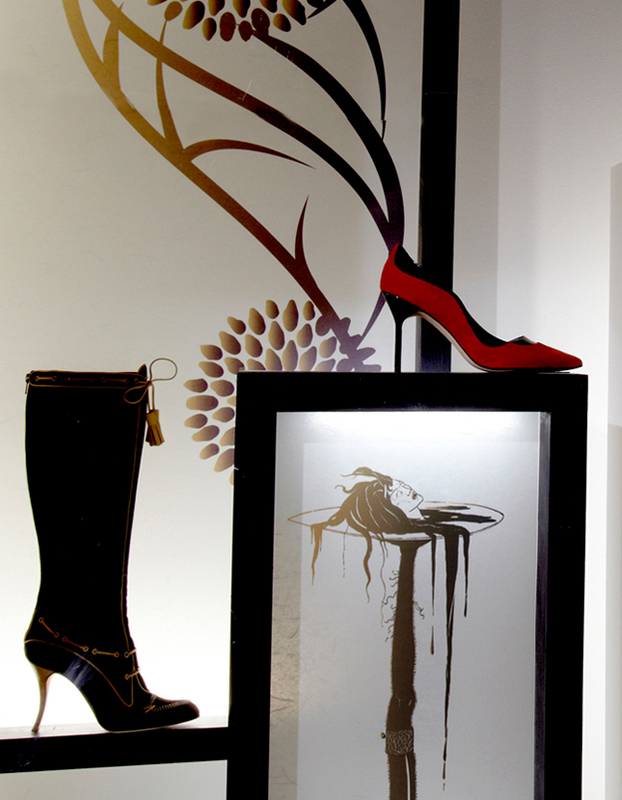 The World of Manolo Blahnik is a shop-in-shop at Liberty for a limited period of 3 ½ months. The idea for the window run came from Manolo Blahnik who then briefed Just So who the developed interpretation and realisation of the concept further. ”After the initial concept briefing from the client had been received we then further develop this in-house through a series of creative meetings where all materials were chosen and art-working was executed. Each element was discussed in detail and the concept was then pieced together to realise the clients vision,” explains Stuart Henry from Just So. An in-depth interview with the company coming soon.